Bifrost Obsidian Charters Moss from Firespiral Slings is 100% combed cotton and 255 GSM, making it a medium weight wrap. It’s woven using Firespiral’s Alchemy Weave, which is slightly looser and makes for lovely soft & mouldable wraps. Accirding to Norse mythology Bifröst (pronounced something like ‘BEEF-roast’ with a Scandinavian accent) is a burning rainbow bridge that reaches between Midgard (Earth) and Asgard, the realm of the Aesir gods. When Firespiral asked their fans to name this stunning weft, it was the first thing that sprang to my, and a number of other people’s, minds. The colours of Bifröst, which fade from hot pink through peachy orange, yellow, mint green, bright blue and purple along the length of the wrap, are vivid and positively glow against the black Obsidian warp. The blocks of colour break into stripes as they meet the next shade, creating a beautiful merging effect. The Charters Moss design is inspired by the Aurora Borealis, or Northern Lights, and named for the atmospheric location of an ancient settlement in the north of England. The wrap features Eldar Futhark runes along the bottom rail and an almost elemental triangular design along the top. These look awesome and help you differentiate the rails so it’s a great design for beginners... or those people trying to wrap with one eye on their three year old who’s standing at the top of a steep hill & is convinced he should be able to fly. Charters Moss features swirls and twinkling stars in the uppermost part of the design, while the bottom is filled with a beautifully textured, stylised tree line. Bifröst has mirrored hems so you can wear either the Obsidian or the rainbow face out. I can’t decide which I like best and would definitely wear both. Bifröst’s appearance changes significantly depending on where the colours fall in your carry, with the colour sequence repeating every 1.3 metres. I had the privilege of testing and reviewing the first Charters Moss prototype and loved the design from the outset. Even then, I envisaged a colourway that captured the fluctuating rainbow of the Aurora Borealis against the night sky. Bifröst does exactly that and was well worth the wait. In hand, Bifröst feels true to its weight, blankety soft, and cuddlesome. The design creates a fine texture that’s most concentrated in the tree line in the bottom section of the wrap. The Charters Moss design provides a perfect balance of grip and glide. Bifröst is easy to wrap with but stays exactly where you put it. I don’t want to sound like a stuck record but, just in case you missed my other reviews of Firespiral’s Alchemy Weave cotton, it’s fabulous! In a medium weight like Bifröst it’s cushy, and comfortable, mouldable and soft from the outset. 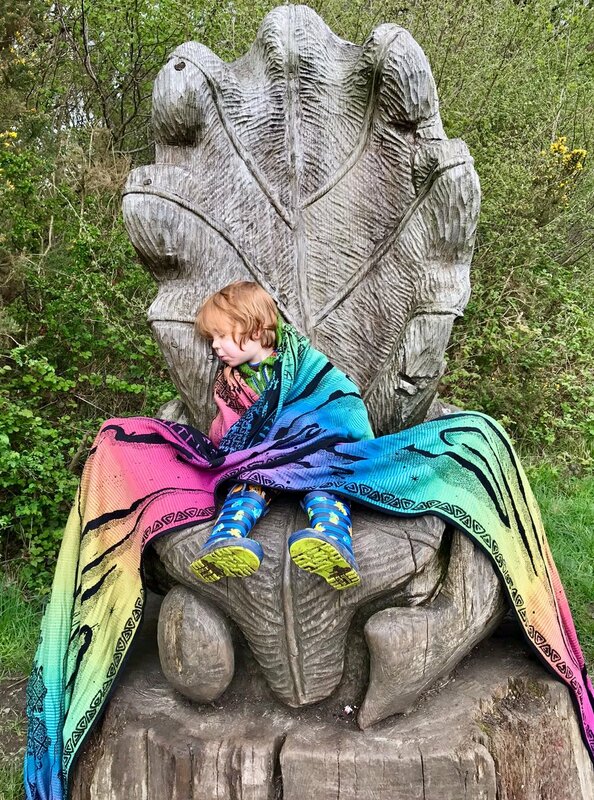 I chose to wrap my youngest in one (Glacial Sand Seafoam) when he was a day or so old and I still carry his 98th centile 3 year old brother in that and our other medium weight Firespiral wraps of the same blend & weave (Autumn Dendron Harvest and Pomegranate Twilight Fractals). In short, they make a fantastic ‘birth to potty’ all rounder. 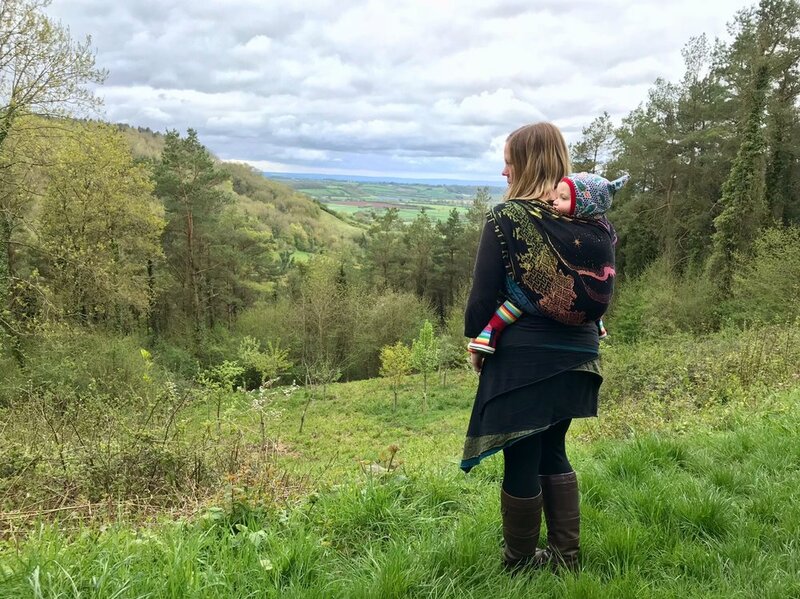 With Bifröst, like these other wraps, if I plan to carry my giganta-toddler [eek, is he technically a ‘preschooler’ now? I’m totally not ready to admit that!] for long periods, I prefer to use a base size wrap with a solid multi-layer carry. However, as he now tends to demand “down” quicker than Heimdall could spot an intruder, a shorter wrap works just fine. I’ve tried him at home in Bifröst in a Shepherd’s and a Ruck Tied Tibetan for the 15-20 minutes a Bourbon and Alphablocks bought me, and it was perfectly comfortable & supportive. 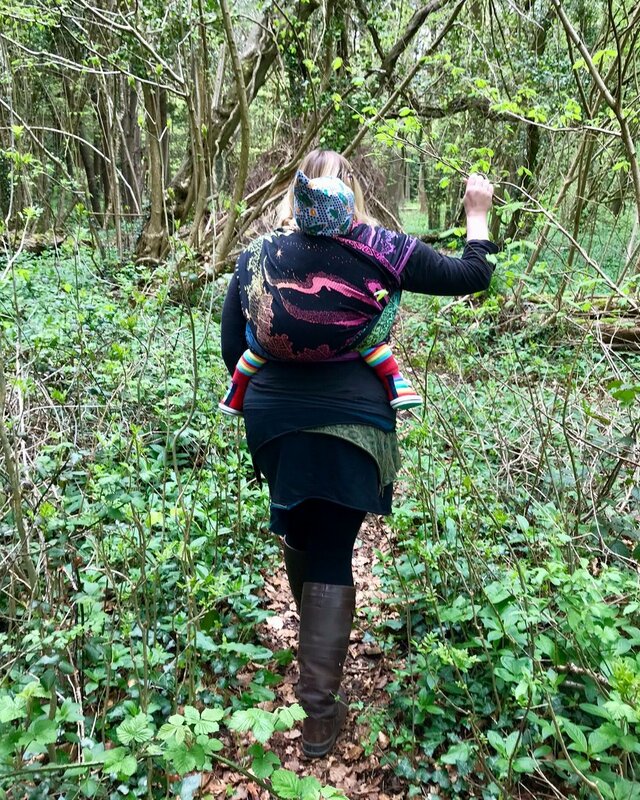 I carried my more average sized (50th centile) 14 month old in Bifröst for hours in a Double Hammock, and he felt as light as a valkyrie’s hand-luggage. A base -2/3, or even a short wrap in a ruck, would be lovely and comfortable with him even for long periods. Bifröst is easy care and can be machine washed and tumble dried. I found it didn’t need much of an iron after washing and that crinkles from wrapping fell out quickly. Bifröst is a stunning, easy care & wear wrap that’s great from birth to toddlerhood. 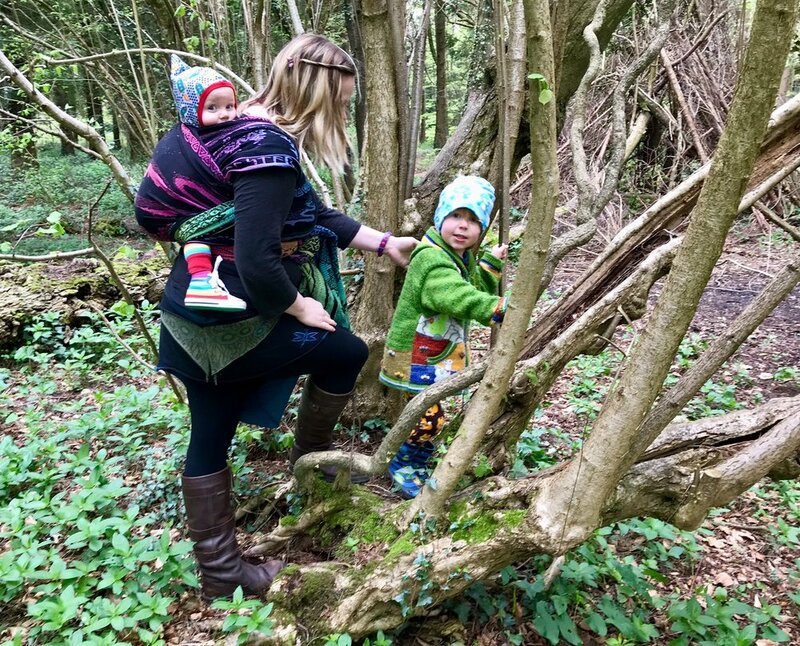 Ideal for new and seasoned wrappers alike, it’s the first wrap that my boys have actually fought over and I can see why. The colours are captivating and, being Firespiral Alchemy cotton, it’s cuddle worthy soft from the start. Bifröst Obsidian Charters Moss will be released onto the Firespiral Slings website on 12th May as a limited one-off release. I recommend following them on Facebook for all their news and details of upcoming releases.